Microchips in Britain's new ePassports only have two-year warranties, a National Audit Office report says. They are so new, no-one knows how long they will last, or how the scanners reading them will work, the NAO said. Public Accounts Committee chairman Edward Leigh said the fact they had a two-year warranty, when passports were kept for 10 years, was "most worrying". The Home Office said the ePassport had been rigorously tested, but it would work to improve the warranty. The chip holds biographical details - including the passport photo - which are scanned at a reader. The NAO report praised the department's Identity and Passport Service for bringing in the new passports on time and to international standards. But it urged the service to investigate the possibility of a longer chip warranty with the manufacturers. "Although it has been tested in laboratory conditions, the ability of the chip unit to withstand real life passport usage is unknown," it said. There were also some concerns that different parts of the Home Office had not formally liaised over introducing the scanner that read the chips at passport control. As a result it will be March 2007 before all UK ports of entry have the scanners. Conservative MP Mr Leigh congratulated the Home Office on bringing the project in on time and on budget - the contract is thought to be worth £448m over 12 years. If the government can't get this right, why should anyone believe they can launch an immeasurably more complex ID card database? But he raised concerns about the warranty deal and added: "Many UK ports of entry are not yet fully equipped to deal with the new technology, raising the spectre of even more delays for travellers. "It is disturbing, if not surprising, that the two arms of the Home Office concerned with delivering and implementing this change failed to talk to each other in the planning stage. The Home Office said it had "full confidence" in the new ePassport, of which 4m have been issued, following thorough testing. But it said it would work with companies supplying the chips to improve the warranty "as market confidence grows". Home Office minister Joan Ryan added that they would "safeguard identity", something the government intended to build on with identity cards to aid the fight against terrorism, illegal working and people trafficking. She added: "This will include incorporating fingerprint data in passports starting in late 2009 to keep our passports - and the identities of their holders - among the most secure in the world." For the Conservatives, shadow home secretary David Davis highlighted the report's suggestion that some ports and airports will not have epassport scanners in place in time. Taken together with the prospect of chips not lasting as long as the 10 year passport "holiday makers and business travellers will face much uncertainty and the real possibility of being stranded". He said the report's findings was "another reason why ID cards are a bad idea". 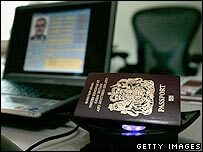 Lib Dem home affairs spokesman Nick Clegg said ePassport chips could be easily hacked in to, saying: "If the government can't get this right, why should anyone believe they can launch an immeasurably more complex ID card database?"